terminal unit (RTU) which is very versatile and simply designed. 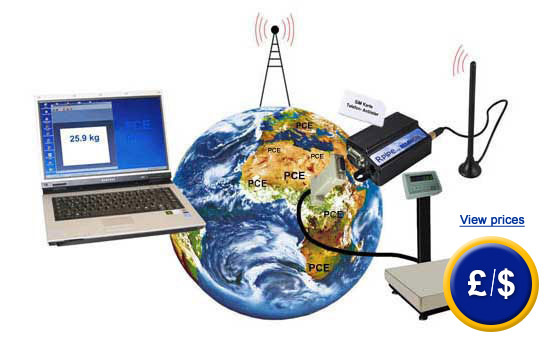 With this GPRS Transmission Module Rpipe data can be transmitted from one side of the world to the other without restrictions due to the common worldwide mobile phone network. 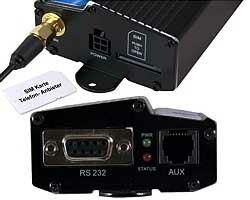 Due to the virtual RS-232 device data can be transmitted and transparent via serial integrated interface. Hence, there exists the possibility to query data of the system even if you are not on site. The Transmission Module Rpipe has a stable aluminium casing that can also be used and integrated in a control cabinet in rough conditions. If you have any questions about this GPRS Transmission Module Rpipe, see the technical specifications below or contact us: UK customers +44(0) 23 809 870 30 / US customers +1-410-387-7703. Our technicians and engineers will gladly advise you on all data loggers and all products in the field of measuring instruments, regulation and control and scales. 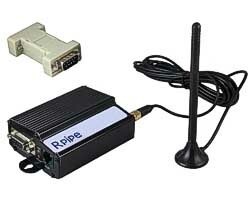 Here you can see the GPRS Transmission Module Rpipe with its antenna and adapter. Here you can see the GPRS Transmission Module Rpipe with all connections.